Once the necklace has edging brick stitch around the entire edge, it's time to do a little math. 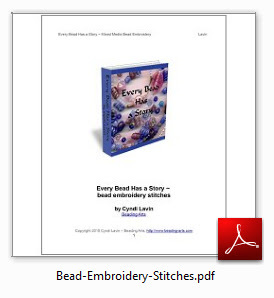 To make it easier, I started from the middle and worked outward, tying a small piece of black Nymo thread at each space where I would stitch a CZ or an accent bead (these are the CZ beads that I got from Artbeads). 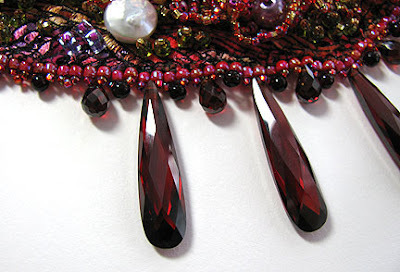 All the rest of the necklace would be finished with a simple three-bead picot stitch. 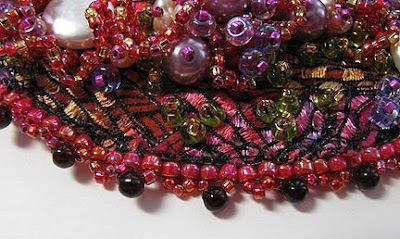 I recommend going back for a second or even a third pass through the section where the accent beads and CZs are added. Their weight could prove to be too much for a single strand of beading thread over time. 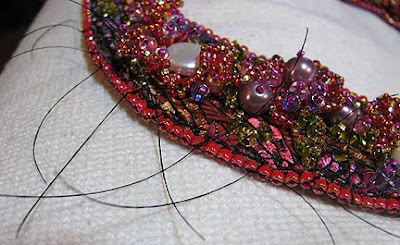 Here is the piece with all the beading done. You can see the wires sticking up from each end: they were curled into a circle and stitched in place to the back of the front fabric before the edging was done. This method gives you a very strong and clean finish at the top edge. 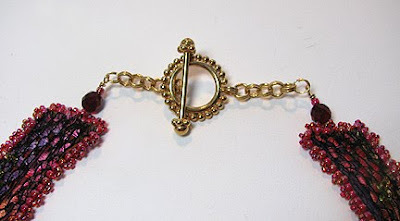 Add a couple of beads and turn a wrapped loop around the chains of a toggle clasp. You're done! 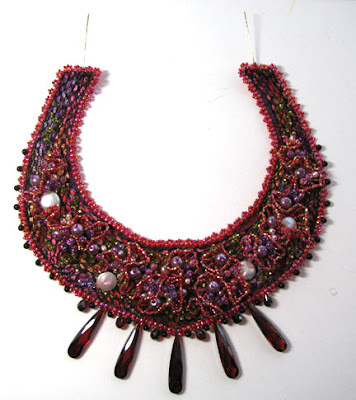 Every time I see your bead embroidery I am left speechless. This is so luscious! Wow, gorgeous!! 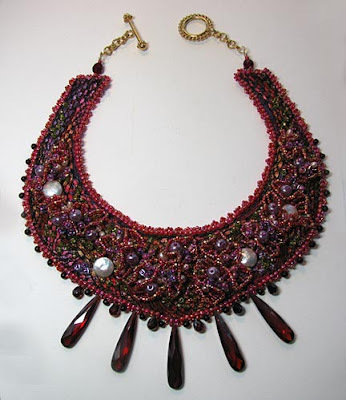 The finished necklace is unbelievably fabulous. It made me think, oohh, Scheherazade. The dangles are the perfect finishing touch. I think I would hang it on the wall in a shadow box to display when I wasn't wearing it - like most of the time, so that I could enjoy it every day. it is so beautiful - I love all the inprogress posts - lets us all know how much work goes into a piece like this - it is gorgeous! Thanks guys :-) Eileen, I am definitely running out of room...time for a sale maybe. When I saw this I immediately thought "Midnight at the Oasis" because it looks like something from Aladdin and the desert. Beautiful work! Simply magical, I love it. Queen of the night type necklace. btw, this is Misty from beadingaholics. Cheryl thanks! I love using the names of strong women for my pieces. On my way over here from the Artsy Bloggers Link Roundup I was thinking "Cleopatra". Funny to see someone else had the same thought. I love Midnight at the Oasis. How about Tales of a Thousand Nights? Oh I like that too, Eileen! I'm putting that one on the list for future use, thanks! Wow, Cyndi, that is spectacular, glorious and downright fabulous! Love the luscious reds!! How about Martian Bliss- the red planet!